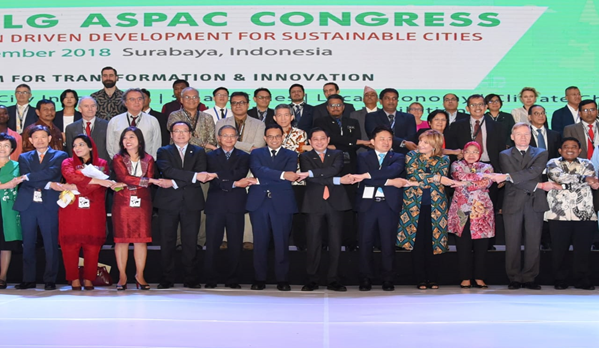 The program waste to energy is mandatory, especially for big cities in Indonesia, according to the Minister of Energy and Mineral Resources (ESDM) Ignasius Jonan in his remarks at the Asia Pacific (Aspac) The 7th United Cities and Local Government (UCLG) event. ) Congress in Surabaya, Thursday (13/9). Jonan explained that the central government continues to encourage every city or region to become a large and modern city, for that good waste management must be done, one of which is waste to energy, making waste into electricity. Furthermore, Jonan asked the Regional Heads to build a Waste Power Plant (PLTSa) in their respective regions. According to him, only a few cities have used waste for electricity, one of which is the City of Surabaya, namely the Benowo Waste Power Plant (PLTSa) with a capacity of 11 MW. "I hope that in particular to the Mayor, Regional Head and Governor must continue to encourage to build power plants to manage waste as quickly as possible," he said. According to Jonan, the biggest challenge in managing waste into energy is because every Regional Government feels that garbage is a commodity. "So if the PLTSa is built, even those who build electricity must buy the garbage. Now this is a long debate," he added. For the Regional Government that plans to build PLTSa, Jonan ensures that the electricity will be purchased and channeled into PT. PLN. In addition, he provided a solution if the region did not want to bother with the PLTSa development, please send a letter to Jonan so that PT. PLN will build the PLTSa. "If for example you don't want to get dizzy, write to me, say that you want the PLN to build, then I will make a decision to get PLN to build. Later, PLN will receive the waste in front of the generator , "he said. Closing his remarks, Minister Jonan asked the Regional Government to reduce their ego in terms of waste management, so that it would create a better quality of life. "This is not about technology and tariffs, because the tariff is appropriate, but about how we reduce the ego of the Regional Government to make this (PLTSa) " he concluded.